Dale Terbush, "When You Walk in the Company of Angels" Poster (1996). 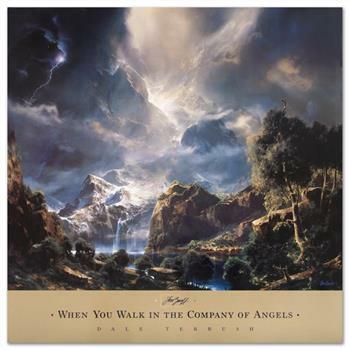 "When You Walk in the Company of Angels" is a poster (1996) on paper by Dale Terbush. Measures approx. 27" x 27" (with border), 27" x 23" (image). Dale Terbush celebrates life by living in a constant state of creativity, thriving on productivity and sheer enthusiasm. Terbush is a master at transforming a beautiful image into something that is purely spiritual and poetic, painting a mood, creating mesmerizing magic. Dale Terbush was born in a Chicago suburb in 1948. Soon thereafter his family moved to Southern California's San Fernando Valley. As a young child he answered what was to be his life's calling - he began to paint. With an innate intuitiveness he easily developed a desire to excel and thus pursue his natural talents. He can capture a landscape that comes from within his own imagination; it flows from his sense of spirit and self. 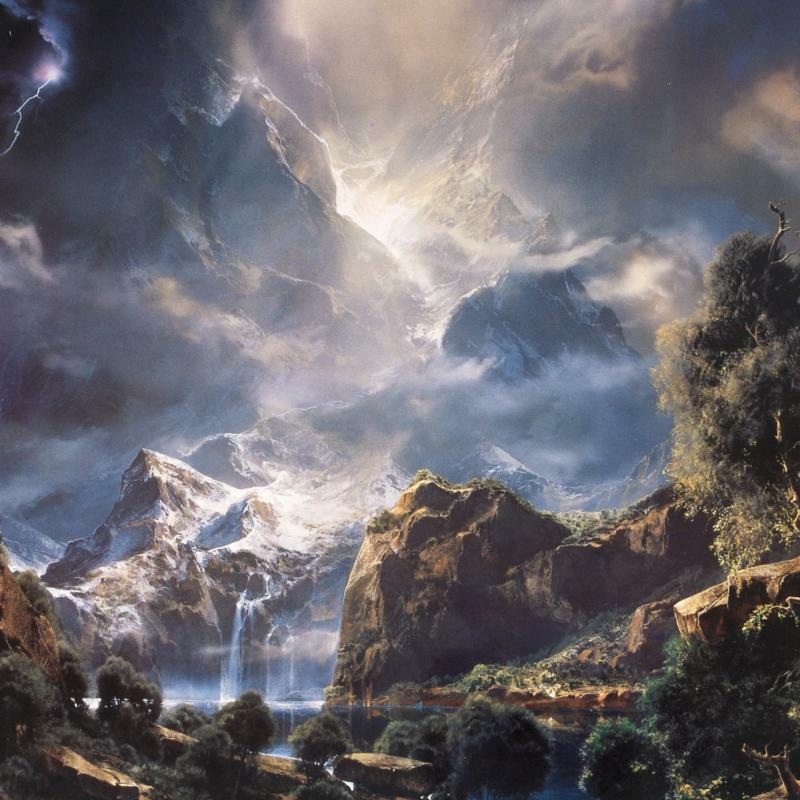 Terbush's romantic visions are often reminiscent of the Hudson River School of painting - the 19th Century art movement developed by artists who glorified nature, creating Eden-like scenes of lakes, rivers, mountains and other pastoral subjects. In his paintings, Terbush creates intensity through the use of color and light. He is a master of illumination, skilled at using exciting, yet unexpected, color. Some have even compared his use of color to that of the 20th Century Master Maxfield Parrish. Whether an original painting or remarkable reproduction, Terbush's work is highly sought after all over the world. Collectors of his paintings range from Celestine Prophecy author James Redfield, developer Donald Trump, Country Western singer Reba McIntire and International Heads of State. Terbush has even broken gallery records world wide and has had four spectacular sell out shows in Japan. His international acclaim continues to grow.